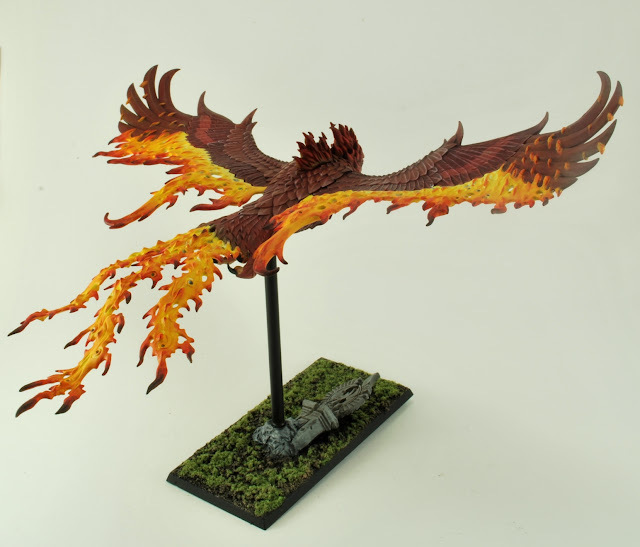 MiniKingdom: High Elf Phoenixes with better flight stands! 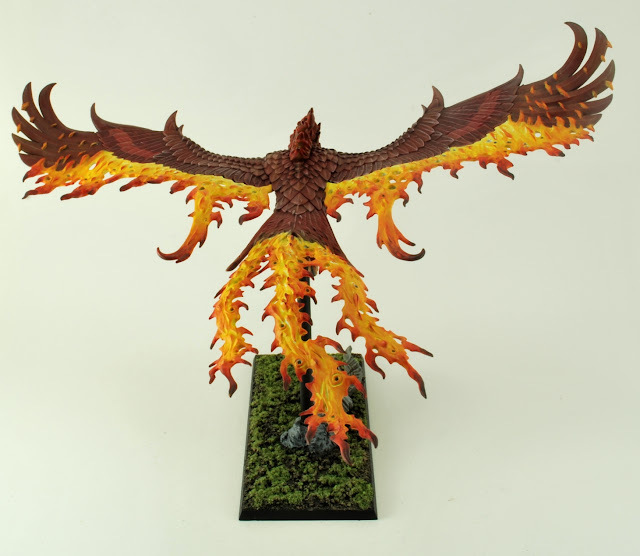 Games Workshop's new phoenix models are plenty impressive in their sheer scale and flair. 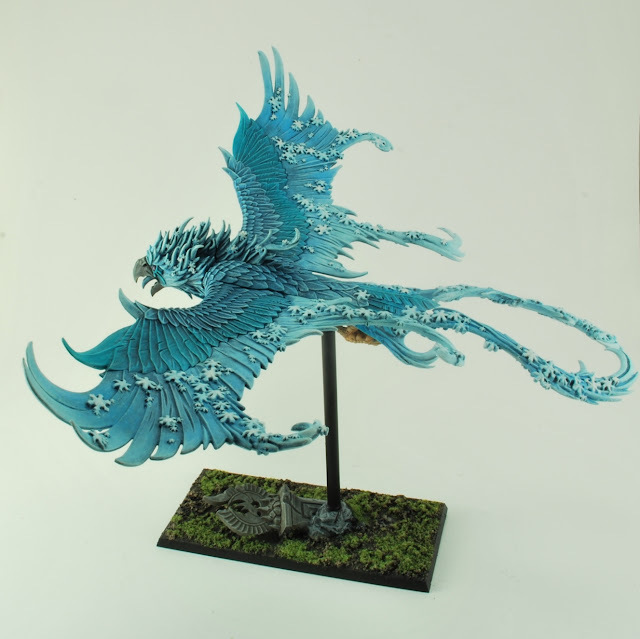 The kits are versatile and easily magnetised for removable riders and even comes with an additional Lord on foot which I was not expecting. 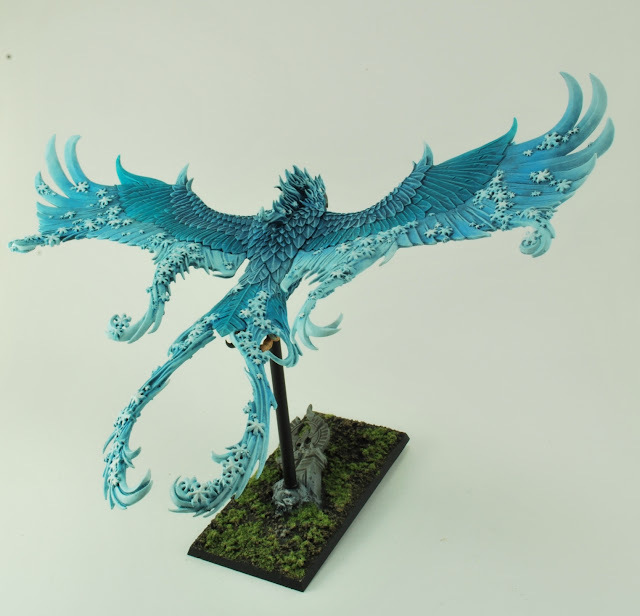 I had the opportunity to paint two of these models as part of a commission: one as a Flamespyre and the other as Frostheart. 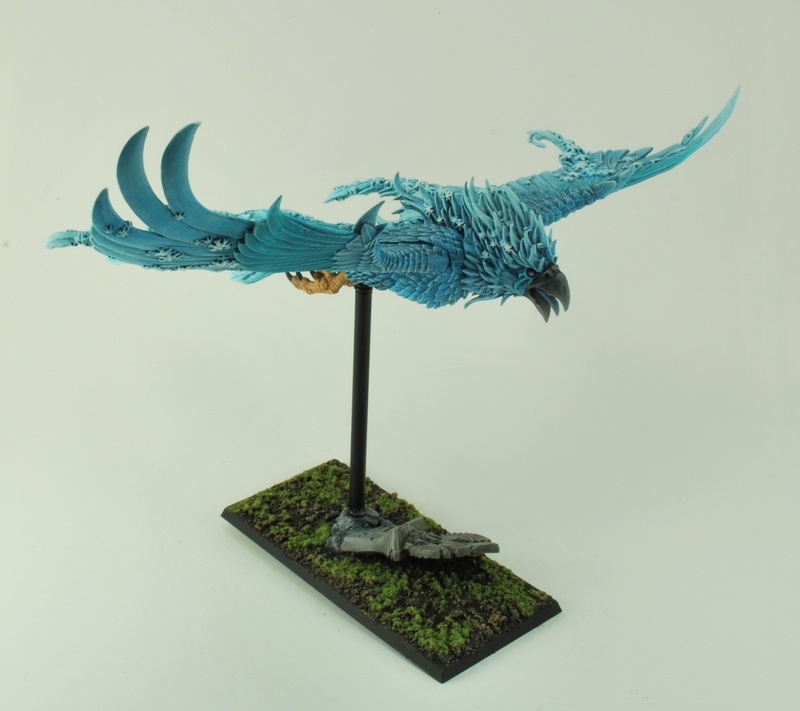 The only glaring problem with the kits are the provided ball and socket acrylic flight stands. After painting had been completed it proved difficult to take any decent photos of the final models. In this specific case I could not use glue to permanently fix the ball of the flight stand to the model (the models needed to be shipped to the client) and as we all know GW fixed flight stands are prone to breaking due to their brittle nature. 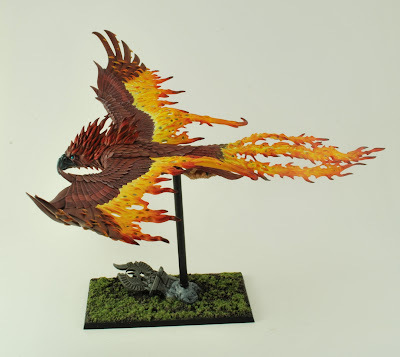 The design of the flight stand, without any sort of permanent fixative, is fundamentally flawed given the weight of the model and the positioning of the socket, this is without even adding on top the rider at the head. So, I was not happy to complete the commission without providing a suitable solution. And so this is where Corsec Engineering came into play as they produce a wide range of robust and versatile flight stand solutions for a variety of game systems; I first discovered this awesome company for Dystopian Wars for their big heavy flying machines. 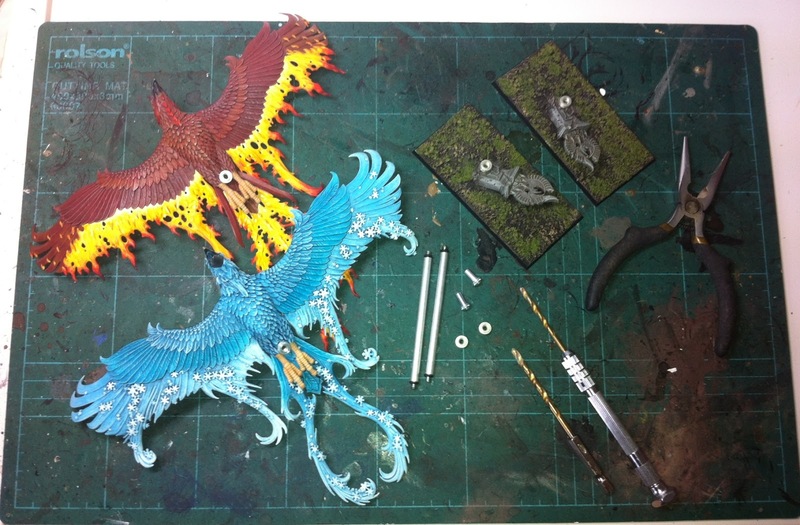 For the phoenixes I used the Omni-Stand Rods, with small mounts in the existing flight base with a moutning peg in the actual body of the birds. (You can choose from many different fittings depending on your needs.) The rods are screwed into these pegs making it easy to put together and dismantle for transit and storage purposes, while still providing a solid and secure gaming piece. 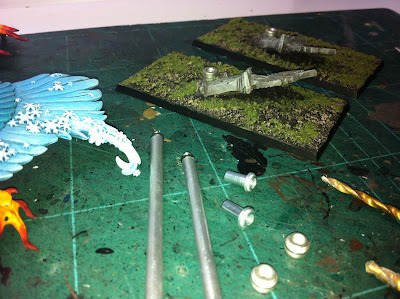 You can probably fix the pegs numerous different ways, but my method for the attaching the regular peg to the body of bird simply involved using a 3mm drill bit to drill through the exisiting socket allowing the peg to fit inside the tail of the bird and securing it with superglue and greenstuff. For the base, to avoid drilling, I used a small mount (no peg) that simple sat in the indent of the hole and glued it and greenstuffed it in and added a bit of texture to the surface.